The most elaborate album quilt in the Museum's collection was most likely made as a wedding present for Samual Padgett Hancock by his fiancée, Charlotte Gillingham. They were married on February 22, 1844, not long after the quilt was completed. The blocks were individually signed and dated between 1842 and 1843 by members of the couple's extended family and friends, and many are accompanied by original ink drawings or stenciled designs. Hancock's name is displayed prominently in an embroidered silk wreath, which, in the Quaker style, is dated "Fifth 1843 Month" (May 1843). His fiancée's name appears in a square to the left, and is surrounded by ink drawings of doves and foliage. Born in Gloucester County, New Jersey, as a boy Hancock moved to Philadelphia with his family. He was employed in his father's wood-cording business at the time the quilt was made, but in 1852 he opened his own brickyard; Hancock served as city comptroller from 1870 to 1877. His wife was the daughter of Jonathan Gillingham, a prominent Philadelphia iron merchant, and Phebe Ware Gillingham. Both the Hancocks and the Gillinghams were Hicksite Quakers. The theological turmoil of the Hicksite-Orthodox separation of 1827 had lessened the aesthetic simplicity or "plainness" that had been somewhat characteristic of Quaker decorative arts in the eighteenth century. 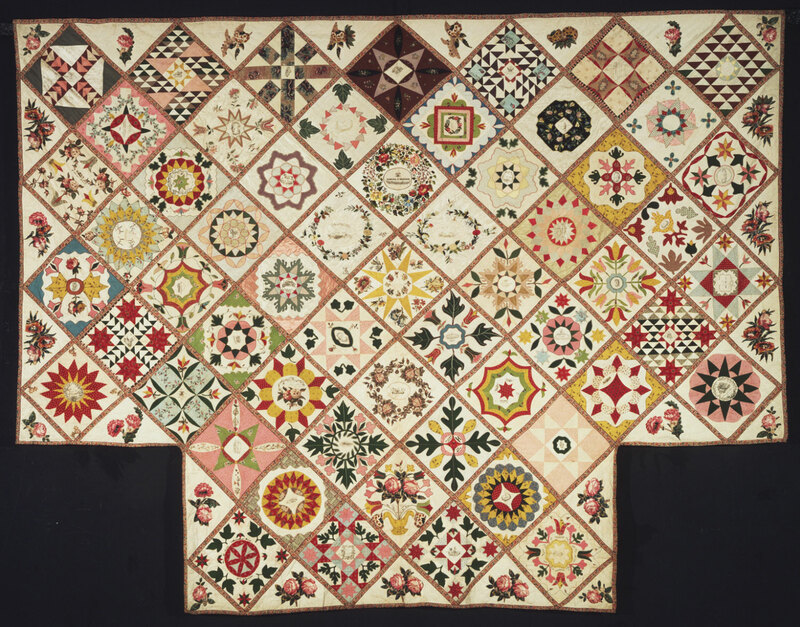 The complexity and sophistication of this quilt's design and technique may illustrate this relaxation of the uniformity that tended to characterize earlier Quaker aesthetics. This quilt's well-balanced palette and the layout of diagonally arranged squares set apart by narrow strips of chintz most closely resemble those of certain Baltimore album quilts with patterns based on cut-paper designs and of Charleston broderie perse quilts. The squares are decorated using a variety of techniques: chintz appliqué, traditional pieced work, and fine needlework. Many of the appliqués show a Pennsylvania German influence in both their color and design. Most of the textiles are dress fabrics dating from 1830 to 1840, including several Chinese export and plain Quaker silks. Roses from a roller-printed furnishing chintz are appliquéd around the border. The fancy needlework used in many of the quilt's squares is unusual. Several include wreaths made with chenille, crepe, and china ribbon embroidered onto white satin, a technique first taught in America during the late eighteenth and early nineteenth centuries in Pennsylvania's Moravian schools. Directions for both fine and plain needlework could be found in published guides such as Miss Lambert's Book of Needlework of 1842, the most popular of such manuals and one that was reprinted several times in New York and Philadelphia following its original London edition. The Berlin needlepoint patterns used in several squares have been worked on a silk fabric, rather than the usual canvas, using a technique outlined in Miss Lambert's guide. Canvas backing was first stitched to the silk, and the pattern was worked through both layers with floss silk thread; the canvas threads were then drawn out by the ends, leaving the embroidery intact on the silk ground. Dilys Blum, from Nineteenth-Century Appliqué Quilts, Philadelphia Museum of Art Bulletin (1989), p. 26. This elaborate album quilt was most likely made as a wedding present for Samuel Padgett Hancock by his fiancée, Charlotte Gillingham. They were married on February 22, 1844, not long after the quilt was completed. The Hancock and Gillingham families were Hicksite Quakers. Dilys E. Blum, from The Fine Art of Textiles: The Collections of the Philadelphia Museum of Art (1997), p. 96.